In physics you have the term ‘power of orientation’. Though the mass of energy is there, the current will not flow. It must be connected to the magnet and then the electric current will flow through the power of orientation. Even so, the mental energy which is dissipated and misdirected in various worthless unproductive thoughts should be well directed in proper positive and creative channels. Do not store in your brain useless information. Learn to unmind the mind. Unlearn whatever has been of no use to you. Then only can you fill your mind with positive or creative thoughts. You will gain new mental strength as the dissipated mental rays are collected now. 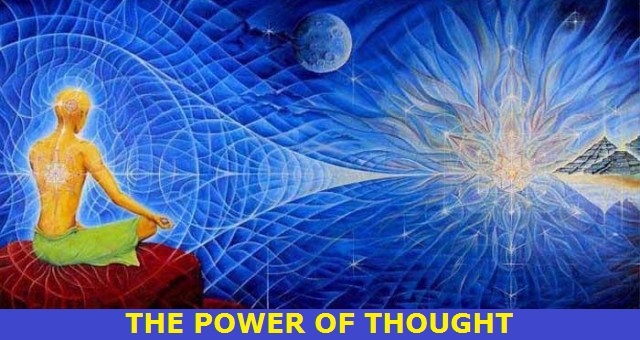 Thought is a vital, living dynamic power—the most vital, subtle and irresistible force existing in the universe. Through the instrumentality of thought you acquire creative power. Thought passes from one man to another. It influences people; a man of powerful thought can influence readily people of weak thoughts. Careful reflection will show that the entire universe is in reality the projection of the human mind—‘Manomatram Jagat’. Purification and control of the mind is the central aim of all Yogas. Mind in itself is but a record of impressions that keep expressing ceaselessly as impulses and thoughts. The mind is what it does. Thought impels you to action; activity creates fresh impressions in the mind-stuff. Thought has the potency of creating or undoing the world in the twinkling of an eye. Mind creates the world according to its own Sankalpa or thought. It is the mind that creates this universe, (Manomatram Jagat; Manahkalpitam Jagat). Through the play of the mind, a Kalpa is reckoned by it as a moment and vice versa. Like a dream generating another dream in it the mind having no visible form generates existent visible. James Lane Allen had long been impressed by the ancient philosophy that a men becomes what he thinks, that a man’s character is the outward expression of his inward thoughts. He had traced it back to the Upanishads, sacred literature of the Hindus : “Man becomes that of which he thinks.” He had found it eloquently expressed in the writing of Buddha : “The mind is everything; what you think you become” .... and in the Meditations of Marcus Aurelius : your life is what your thoughts make it.” He had found the same basic idea in the writings of Confucius, Mohammed, Aristotle, Socrates, scores of others. And he knew it, of course, in its most familiar form- as millions did-from the Bible : “ As he thinketh in his heart, so is he”. All the great teachers of every age had declared this simple truth : that a man’s life and character are the result of his own inmost thoughts and ideals. It was a philosophy as old as civilisation, but ever fresh and new. Surely he had proved the truth of it in his own life, James Allen reflected. He had been very poor in his youth, had known none of the advantages so many young men count essential. He had started out with nothing to build on except what was within himself. But he had known what he wanted to do and be; he had kept his dream, his ideal, everlastingly before him; he had tried to live the life he imagined- and in the end his dream had become a reality. It was a simple, obvious truth, he wondered how anyone could fail to see it. People were forever complaining about things outside themselves, blaming their condition and circumstances on everything but their own thoughts and ideas. Didn’t they realise that they made their own ‘good fortune’ that their lives were the result of their own thinking? Good thoughts bear good fruit, bad thoughts bear bad fruit- and man is his own gardener. He became intrigued with this symbolic idea of the mind as a garden, each man cultivating the soil and seed of his own life. It was the same ancient philosophy, of course, but in new dress. Following are the paragraphs that are most frequently quoted from his book As a Man Thinketh. They reflect the heart of the book, and essence of James Allen’s philosophy. “A man is literally what he thinks, his character being the complete sum of his thoughts. A man’s mind may be likened to a garden, which may be intelligently cultivated or allowed to run wild; but whether cultivated or neglected, it must, and will, bring forth. If no useful seeds are put into it, then an abundance of useless weed-seeds will fall therein and will continue to produce their kind. A man will find that as he alters his thoughts towards things and other people, things and other people alter towards him... Let a man radically alter his thoughts, and he will be astonished at the rapid transformation it will effect in the material conditions of his life. A man should conceive of a legitimate purpose in his heart, and set out to accomplish it. He should make this purpose the centralising point of his thoughts .... He should steadily focus his thought forces upon the object which he has set before him. He should make this purpose his supreme duty, and should devote himself to its attainment, not allowing his thoughts to wander away into ephemeral fancies, longing and imaginings. This is the royal road to self-control and true concentration of thought. Even if he fails again and again to accomplish his purpose (as he necessarily must until weakness is overcome), the strength of character gained will form a new starting point for future power and triumph. In all human affairs there are efforts, and there are results, and the strength of effort is the measure of the result. Chance is not. ‘Gifts,’ powers, material, intellectual, and spiritual possessions are the fruits of effort; they are thoughts completed, objects accomplished, visions realised.